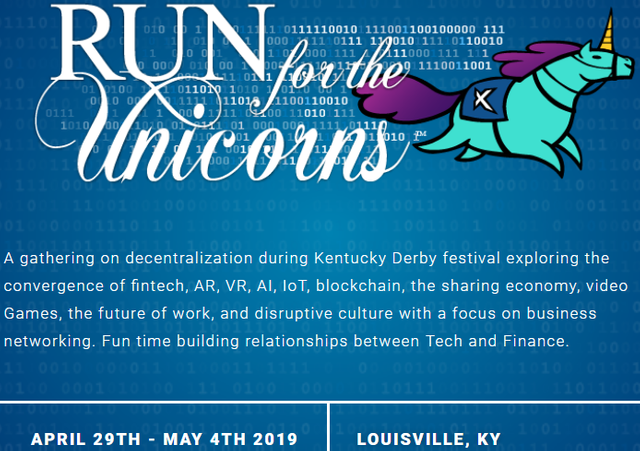 A gathering on decentralization during Kentucky Derby festival exploring the convergence of fintech, AR, VR, AI, IoT, blockchain, the sharing economy, video Games, the future of work, and disruptive culture with a focus on business networking. Went to this event last year and had lots of run as well as attending the Kentucky Derby for the first time too! Even knew some of the speakers and attendees too as well as organizers! See website for more information. Will do more posts (in the near future). Will be offering at least a Run 19 - 1 Day Admission to Expo Only or two days given interest. Please express your interest in the comments below with giveaway contest ideas! May be open to including a STEEM event during the Run with the Unicorns if there may be interest or maybe just a table during the Unicorn Ball for STEEM community (&/or TeamVG) people! Also check out Silica Nexus as the main project behind the Run for the Unicorns with the droid tokens!